There are many articles on the Internet concerning the Dutch expedition of 1874. My focus is on the instruments used on that expedition, and instruments in the Dutch Teylers Museum in Haarlem that are contemporary with that expedition. 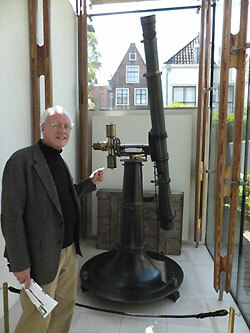 The Utrecht Observatory Museum "Sterrenwacht Sonnenborgh" (Netherlands) had an exhibition entitled "Venus achterna: Sterrenkundigen op expeditie in 1874" which ended 5 September 2004. 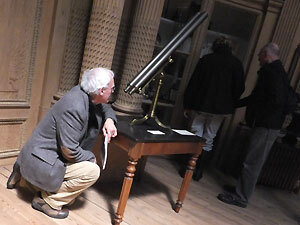 The exhibition centered on the Dutch Transit of Venus expedition of 1874 with documents and records from various Dutch archives. 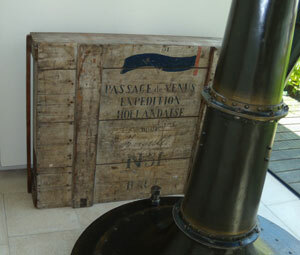 The 1874 expedition went to the Island of Reunion in the Indian Ocean. 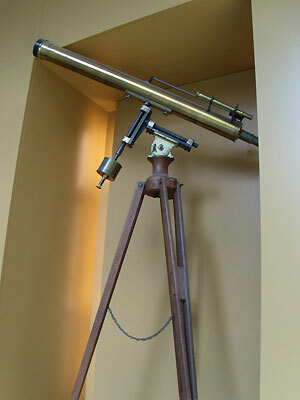 The Teylers Museum in Haarlam displays the instrument used on that expedition. I saw the heliograph parked at the end of a hallway in the museum, but didn't realize what it was until I saw the printing on the wood transport case. What an exciting find! I shouldn't have been surprised. The Teylers Museum in itself is a voyage of discovery that has preserved a huge inventory of scientific artifacts and works of art related to science. Many of the items in the museum are displayed exactly as they were in the 19th century, with elaborate cases and natural lighting which gives the illusion of a trip back into time. The museum is named for Pieter Teyler van der Hulst (1702-1778) who manufactured linens and became a wealthy banker in Haarlem. He was an a leading proponent of the Age of Enlightenment, and created major collections in both the sciences and the arts. He willed his fortune to establish a foundation whose aims included the promotion of the arts and sciences. 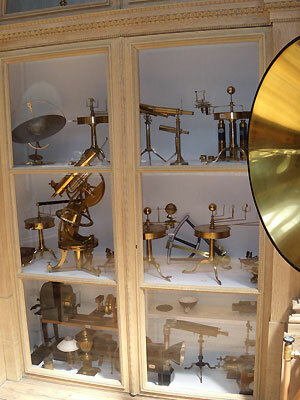 The foundation decided to build a museum to house his collection of scientific apparatus and his paintings. 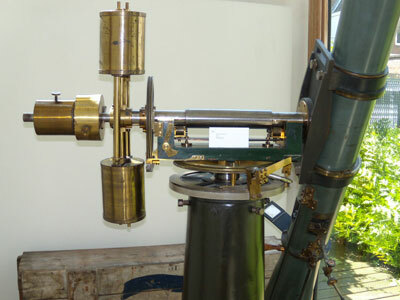 In addition to hundreds of scientific instruments from the 18th and 19th centuries, including microscopes and various optical instruments (as can be seen in the photos below), the museum boasts a number of very fine telescopes. 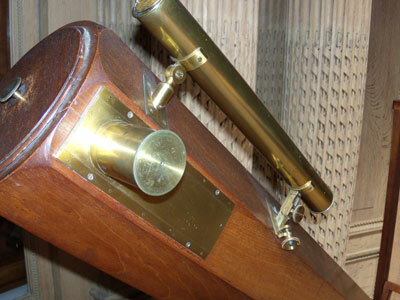 The workmanship, fit and finish of these scopes is nothing short of extraordinary. The Teylers Museum is the oldest public museum in the Netherlands. The instruments in the museum were originally not intended for public display. 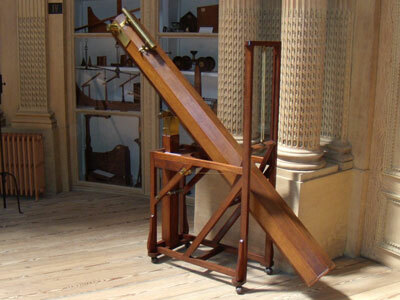 The books were used for study and the physics instruments for education and demonstrations. The fossils and minerals were used in public lectures. The large Oval room, the oldest part of the museum, which houses hundreds of physics instruments, was opened to the public in 1784. Haarlem, one of the oldest and most charming cities in the Netherlands, is only a thirty-minute train ride from Amsterdam's Central Station. This small town is also famous for the Frans Hals museum, where dozens of his paintings are on display, inches from your nose. The Cathedral Bavo is also a must-see. And of course, plan on spending quite a few hours in the Teylers Museum. The trip was the highlight of our stay in the Netherlands! 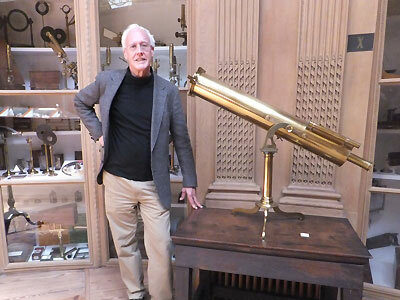 When you discover the cases full of scientific instruments, you will understand why your visit might be a long one. 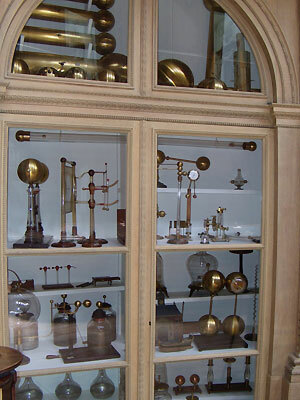 The museum thoughtfully provides a brochure describing all the scientific instruments. In addition, there are some other really delightful surprises at the museum. I won't spoil the surprise by describing them here!